Through our strategic alliance with Darchem, we offer DARMATT flexible passive fire protection systems and DARSHIELD rigid/compact passive fire protection enclosures. DARMATT is designed for the protection of actuators and valves, cable routes, conduits and signal lines, junction boxes, solenoid stations, air receivers, process vessels and other equipment applications requiring fire protection. 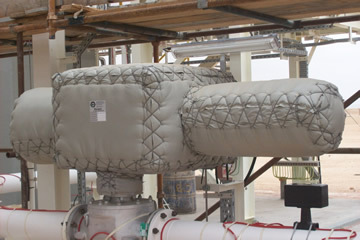 DARMATT flexible mattress systems provide excellent fire protection due to their unique construction of compressed layers of insulating fiber combined with layers of metallic foil. DARMATT is fully tested and certified for use in high-rise hydrocarbon fires such as denoted in the UL1709 and BS476 (Pt 20 Amendment 6487) fire test curves. Such fires reach approximately 2012ºF within minutes. DARMATT has also been successfully explosion-tested to 1.6 bar overpressure. The DARMATT system is entirely asbestos free. DARSHIELD-engineered enclosures are designed and manufactured specifically to fit the protected equipment. They give up to two hours protection against flame temperatures in excess of 2012ºF. Features can be incorporated into the design to provide resistance to both blast and jet fire. DARSHIELD enclosures are designed to withstand the most rigorous fire conditions. They are ideal for the protection of equipment requiring ease of access. The enclosures are constructed using high thermal performance materials encapsulated within stainless steel skins. The versatility of the DARSHIELD system enables a variety of materials to be selected in order to best meet the customer specification. This ensures that the design can accommodate difficulties in location and space restrictions.